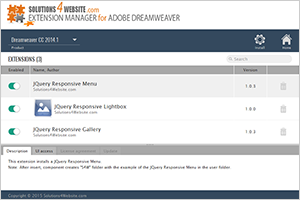 HTML5 Push Menu is distributed as an Adobe Dreamweaver extension, packed as a file, named JQResponsiveMenu.mxp. Read more in the online help. Site navigation is one of the most important elements in website design. Our multi-level HTML5 Push Menu is neat, attractive and usable at the same time and will not push your site visitors away. When user open a sub-level menu, the whole navigation pushes over the content, leaving visible only title of the parent menu on the side. Optionally, this menu slice can be visible or not as the sub menu can cover parent menu and will display back button so user could return to a higher level. Push Menu can even open sub menus inside making menu items smaller. Additionally you can add a trigger button that will hide or reveal the whole navigation saving more space, which is really important on mobile devices. Component is powered by jQuery and it has clear and comprehensible Wizard, you can easily set up, change appearance and edit the content of the menu without digging into CSS files or code! So you don't need to be an expert in web design and to know programming languages to add professionally looking menu to your site. 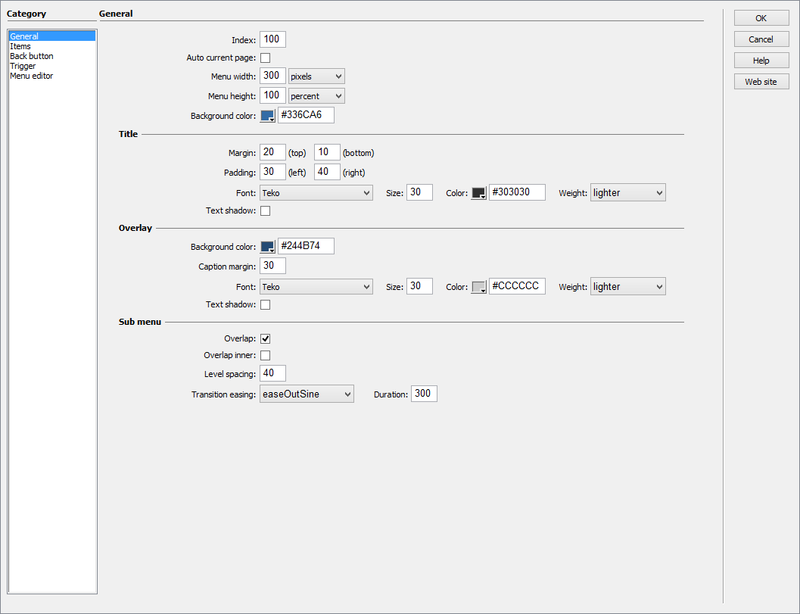 Just insert the menu into your page and change parameters through Wizard according your design to match the site theme. The installation package contains Dreamweaver extension, providing you the ability to easily create high-impact, HTML5-powered menus, all in Dreamweaver CS3, CS4, CS5, CS6, CC 2014, 2015, 2017 and CC 2018. Using the user-friendly user interface, you can adjust almost all colors, fonts, sizes, spacing and wide range of options including more than 70 parameters that you can adjust according to your taste. 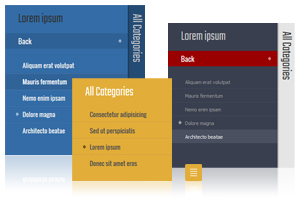 You can easily create necessary menu navigation using menu structure editor. Through theÂ menu editorÂ you can add or remove items from menu, move them up, down, left (level up) or right (level down). Menu has different easing effects and transition duration of the sub item expanding. Menu opens each new sub menu level overlapping parent level, leaving title of the parent menu pn the side. Menu can open each new sub menu level inside and fully cover parent level but will show back button so user could return back to the parent level. You can add a trigger button that will hide or reveal the whole navigation saving more space, which is really important on mobile devices. Installation package contains Dreamweaver extension. Dreamweaver extension allows you to easily create Push Menu. Extension has user friendly interface.